Learn to knit basic beanie hats in all sizes with the step-by-step instructions in this knitting pattern. Order here to download, save, and print a PDF of this pattern. This simple hat knitting pattern teaches you how to make basic beanies in all sizes. These classic unisex hats are a perfect first hat to knit, and they also make excellent gifts for everyone you know. This PDF knitting pattern walks you through making a hat with clear, row by row instructions for adult xl, adult, child, toddler, baby, preemie, and holiday ornament sizes. 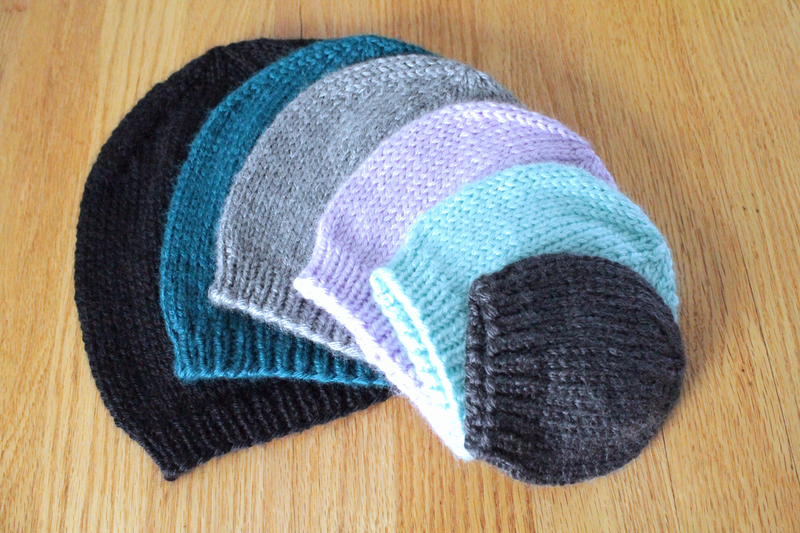 You will make these beanie hats with Caron Simply Soft Yarn, Double Point Needles, and circular needles (optional). You can substitute almost any worsted weight yarn in this pattern successfully; just check your gauge before you start. I’ve found that Malabrigo Rios, a merino wool yarn, makes an excellent substitute yarn for this pattern. These hats are worked in the round from the bottom up. This is a beginner to intermediate knitting skill level pattern that requires a general understanding of knitting in the round, double point needles, and decreases. The larger sizes of this pattern have instructions for using circular needles, as I find working with a circular needle is just a bit faster than DPNs. However, if you don’t have these needles in your collection, you can make these hats with just DPNs. You can also substitute long circular needles and the magic loop method if you are familiar with that knitting skill. Holiday Ornament size measures 3.5 inches by 3.5 inches; 7 inches around. Find my full size chart and how to measure here. If you use the materials suggested in this pattern, your final product will be machine washable. To keep your hats looking their best, hand wash or machine wash separately on delicate cycle in cold water. You may tumble dry on low heat, but laying flat to dry is recommended. This pattern is for personal use, gifting, and charitable donation of completed items. You may also sell handmade items created using this pattern. Do not copy this pattern and distribute it. If you’d like to share the pattern, refer your friends to my website, purlsandpixels.com/shop/, so they may obtain a copy.